Home Built DIY 3 DOF Flight Simulator Motion Platform - Low Cost Motion Platform 3. 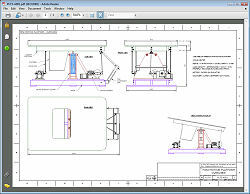 UPDATE Oct 2011 - The Mini Motion Platform plans are now also available as part of the Full Download Plans Set available from the plans order page. UPDATE 13th Feb 09 - Detailed plans are now available for the Mini Motion Platform. They are bundled FREE with orders for the V2 Motion Driver software. I think this mini-motion platform is probably my favourite of the three I've built so far. 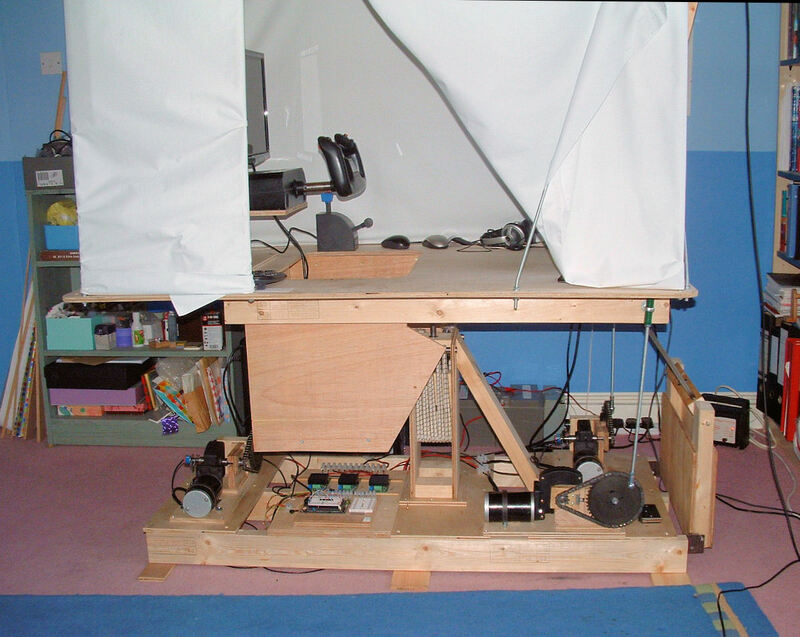 The design draws on lessons learned from the previous two builds and with it I've tried to strike a balance between having enough motion to add real enhancement to the sim experience whilst keeping the structural complexity of the machine as low as possible. Keeping things simple keeps the build cost down, makes it easier to build and easier to maintain. 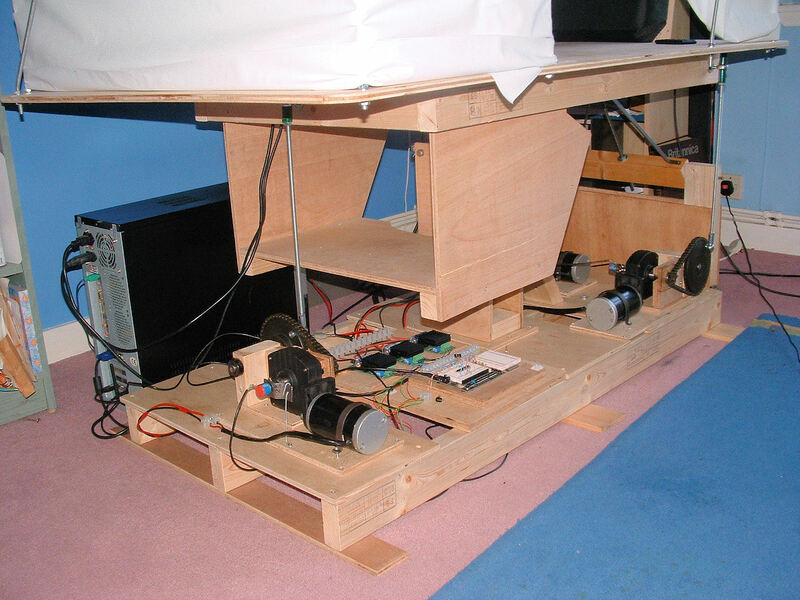 The platform is a 3 degree-of-freedom small-displacement machine, it is a single seater and is small enough to fit in the corner of my room. 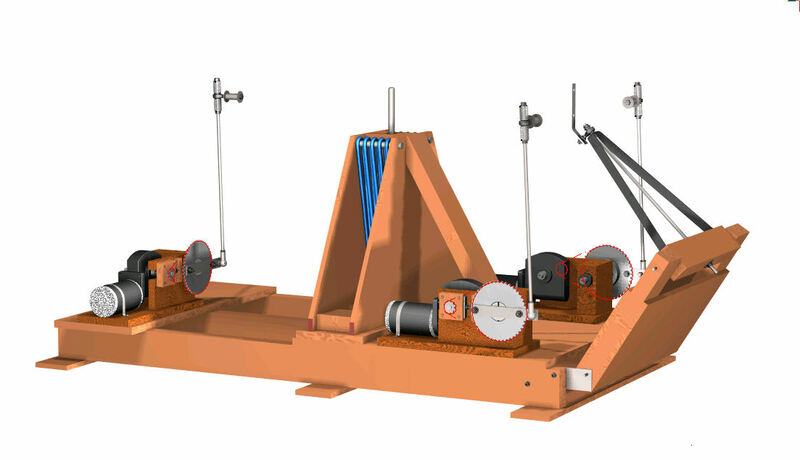 It is based on a fairly conventional 3-point support type rig with a central sprung support and stabilising column. I thought quite hard about the motion range needed for the platform to still make it worth building and it has +/- 9� pitch, +/- 13� roll and about +/- 85mm heave. These are a good deal less than the movement capacities of the other platforms on the site however when used with a visually enclosed cockpit I believe they are sufficient to add a real sense of motion to the flight sim, but to do it at as low a cost as possible. 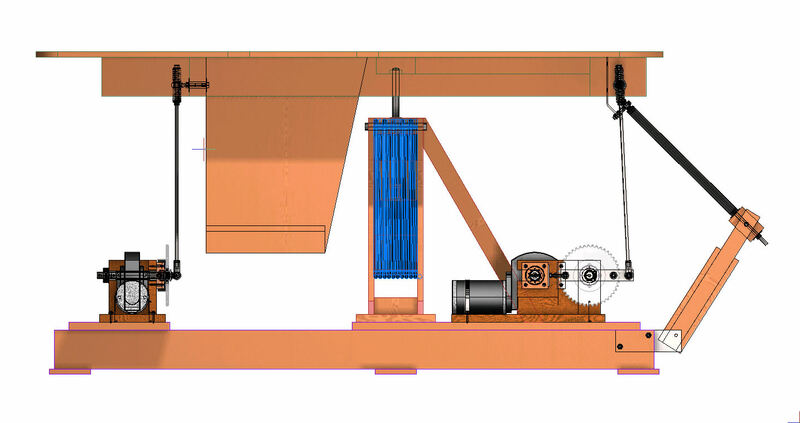 The platform is driven by 3 x 200W electric motors each through worm gearing and a single roller chain reduction stage. 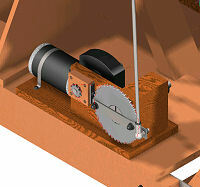 The final drive sprockets carry the crank arms to which the three drive rods are attached and so rotation of the cranks drives the pitch, roll and heave movement of the platform. The majority of the platform weight is carried by the central plunger type bungee cord spring. The spring column and the rear mounted partial Sarrus linkage constrain horizontal linear movement and yaw rotation of the platform. The majority of the construction is in timber and the more heavily loaded machine elements are in steel. Rolling element bearings are used in the drives and linear ball bushings are used to constrain and guide the motion of the bungee plunger spring. I've stiffened up the structure in places as a result of seeing the prototype machine's behaviour. The platform is driven using the motion drive software and single chip SPU servo hardware described on the site. I have used a 36V battery supply to drive the nominally 24V drive motors to generate better speed and load capability - even with this the MD03 speed controllers and the drive motors show little signs of heating in use indicating low current draws. I think the drive gearing has given the drives good force capability which is a good sign for when I want to add a heavier cockpit. IMPORTANT NOTE - the Chinese made 200 W electric motors I used in the build have become difficult to source. You will probably have to find alternative motors if you wish to build a similar platform, if so some speed and torque figures for the actuator crank arm might help - on my platform the torque at the crank arm is 42 Nm at the motor rated torque output and the max speed of the crank arm is 68 rpm. 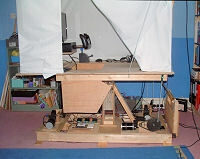 Above are a couple of photos of the prototype build. I fitted a simple fabric covered hood as a temporary test arrangement to enclose the cockpit and used a projector to display the main front view from over the pilot's head. An LCD display is used to display the instrument panel. I think the performance of the platform is surprisingly good. 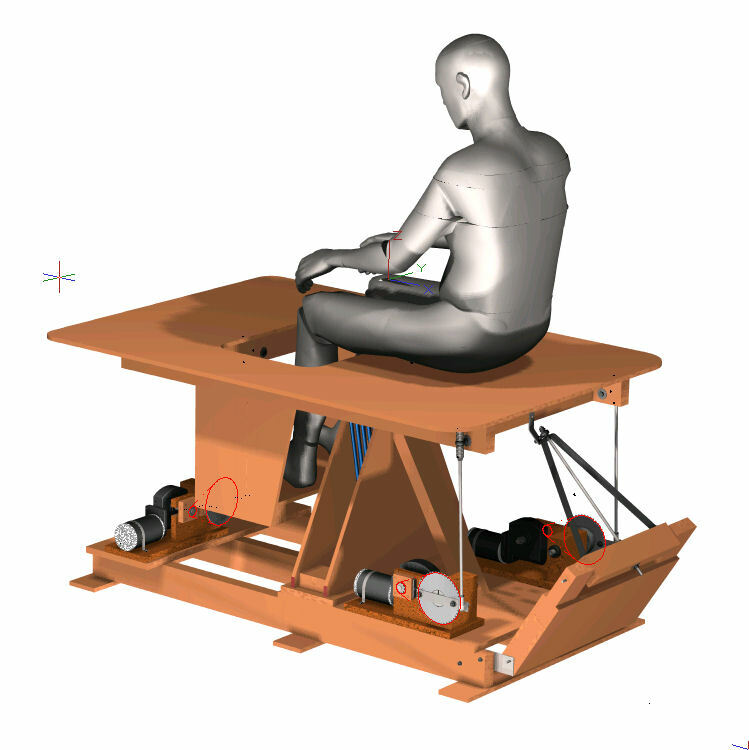 The heave movement is sufficient to provide touchdown-bump effects, take-off motion, turbulence motion and general in-flight heave effects. 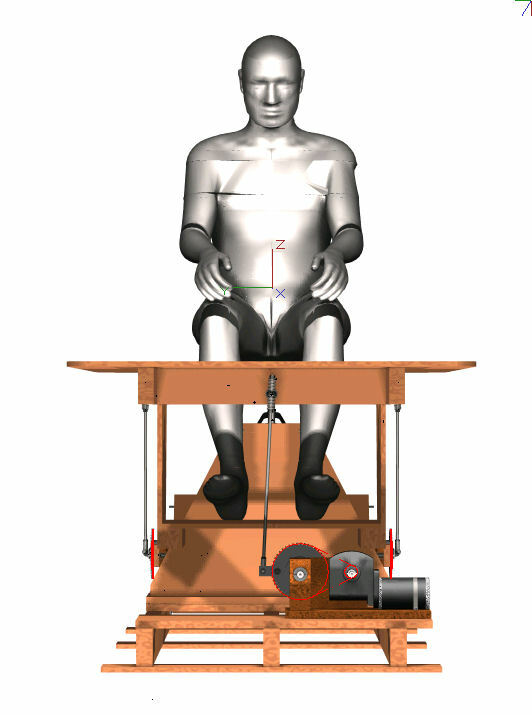 The pitch motion is sufficient (with well tuned software setup) to allow me to feel acceleration and braking forces both on the ground and in the air and to induce a sense of pitch rotation, and the roll motion is good for roll rotations and lateral acceleration force cues. The rig will not have you "hanging in your harness" on heavy decelerations but for GA type flying I like it as it appeals to my preference for simming with as much realism as possible in the flight conditions. I haven't tried tuning the motion for fast jets yet - I'll get round to it and see what it feels like. 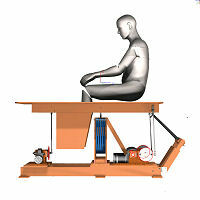 Detailed plans are available for the Mini Motion Platform. They are bundled FREE with orders for the V2 Motion Driver software, AND they are now also included in the Full Download Plans Set available from the plans order page. 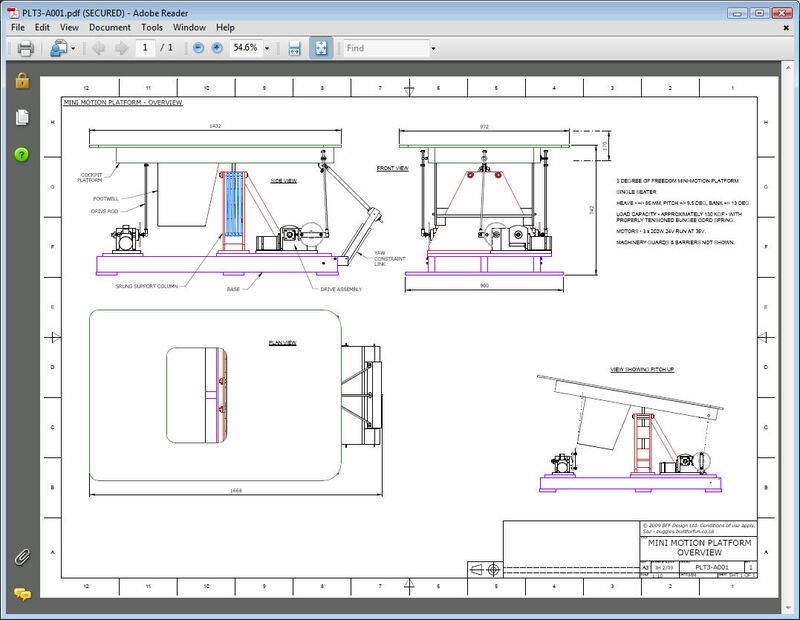 The plans consist of 13 A3 sheets covering the detailed mechanical parts and assemblies of the platform. For the control system hardware and software see the relevant web pages. I've added a few more CAD renderings of the design below - click on an image to get a bigger view. Copyright � 2006-2012 BFF Design Ltd All Rights Reserved.